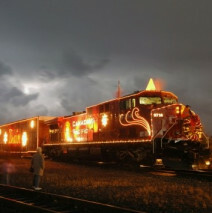 On December 6, Clinton will be welcoming the Canadian Pacific Holiday train during its travels through North America. The train will be arriving at the Saw Mill Museum in the Lyons District of Clinton, IA around 4 pm. Enjoy performances on the traveling stage at 4:30pm with fireworks to follow. Local businesses will be there to supply refreshments and treats as you enjoy the holiday season with friends and family. When you stop down be sure to visit a few of your Rastrelli’s family. We will be serving up our homemade Apple Cider and giving away a one night only special for you to enjoy after the show. So bundle up and meet us down there Thursday, December 6.